Overstock.com is offering a refurbished supply of Barnes & Noble Nook 3G + Wi-Fi e-readers for $99.99. This is the same price that Best Buy is offering for the Nook Wi-Fi version brand new, however Overstock’s version includes free access to AT&T’s 3G network for most functions. Adding a $1 filler item to your shopping cart pushes your total over $100, which then enables you to use coupon code 149418 during checkout. The Nook e-reader line is powered by a heavily-customized and embedded version of Android, though it is not compatible with standard Android applications. Note that the refurbished version of the Nook only has a 90 day warranty. This coupon totally worked! Thanks so much for the tip! Now my mother is getting a Nook for Christmas!!! The coupon code is acting up. It appears Overstock.com may have blocked the coupon just for this item. It’s very odd… when you apply the coupon, there is no error, it simply vanishes. 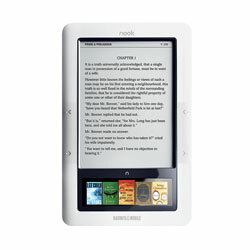 The Nook Color is certainly a compelling e-reader, however, it is much more expensive and lacks 3G. Code still blocked. Too bad, they lose the sale entirely.